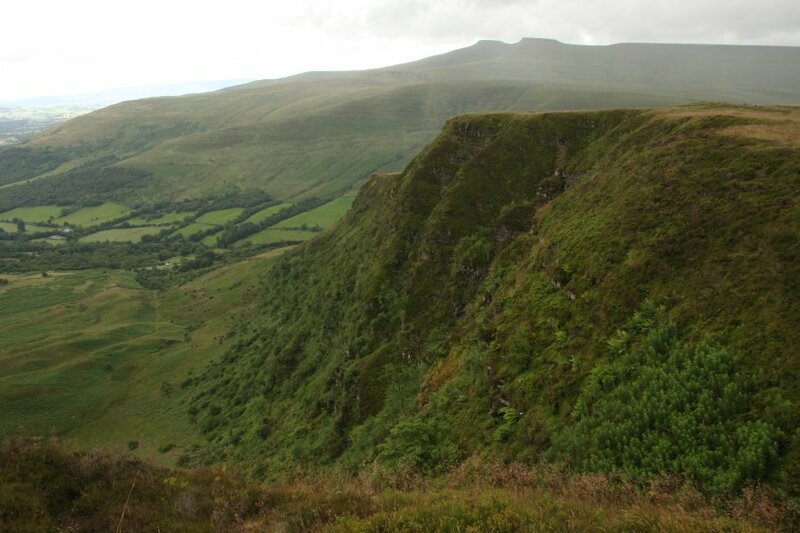 A glacial escarpment in the Brecon Beacons. This walk would take in the last two mountains of the Fforest Fawr range that I had not yet walked, although neither summit really feels like a mountain - more like a ridge extending off the side of the largest summit in the range. Close to the major peaks of the Central Beacons, but on the wrong side of the A470, Craig Cerrig-gleisiad is an immense glacial scarp that almost disappears from sight beneath the larger mountains. A short walk through the forest, and the trees disappear. 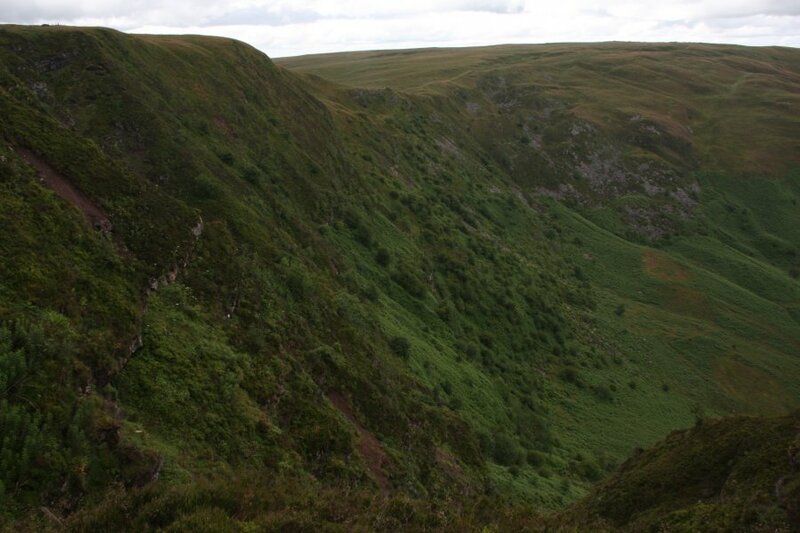 This is the immense Craig Cerrig-gleisiad corrie/cirque, which is about 1 km across. The 629 metre summit sits at the top of the 200 metre cliff. 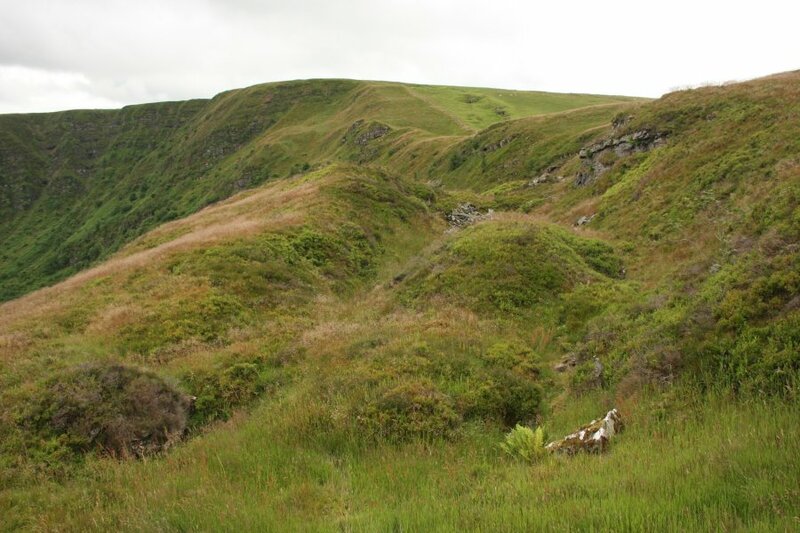 The scarp is the steepest north-facing scarp in the national park, and although it has sunlight for now, for most of the year it sees none. 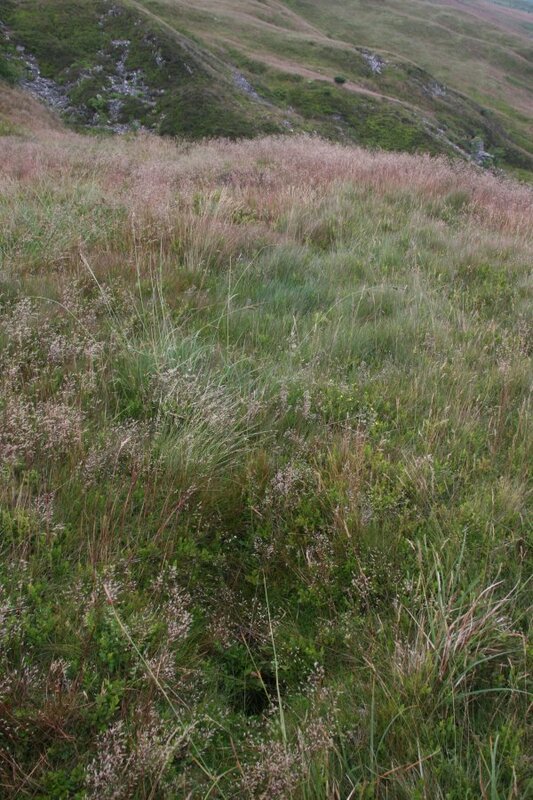 Rare arctic-alpine plants flourish on the slopes, the furthest south that they can be found. Across the Tarell valley (carrying the A470) is Y Gyrn (619 metres) in the Central Beacons - another mountain that is overshadowed by the taller peaks above it. A little higher up, and the whole corrie can be seen, along with its central moraine. The right side is the second mountain; Fan Frynych. 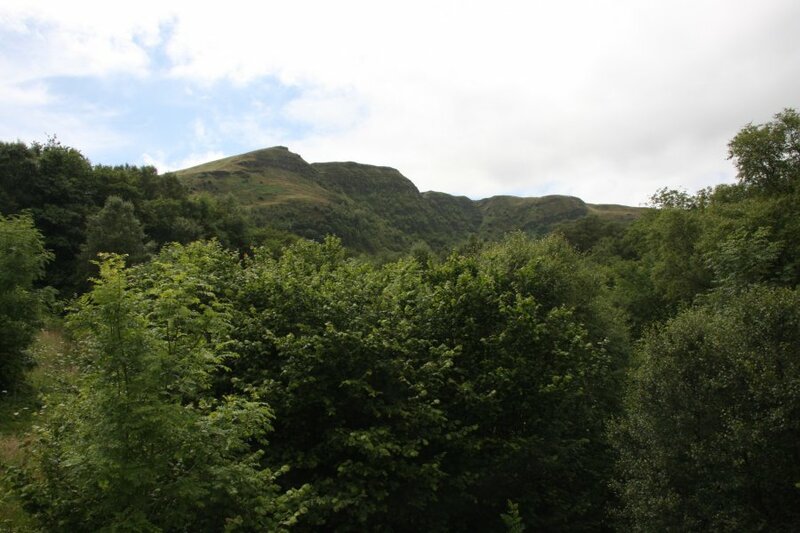 At 629 metres, it matches the height of Craig Cerrig-gleisiad, with very little height lost in between them. The Central Beacons; Pen y Fan (886 metres) and Corn Du (873 metres) in front of Y Gyrn. 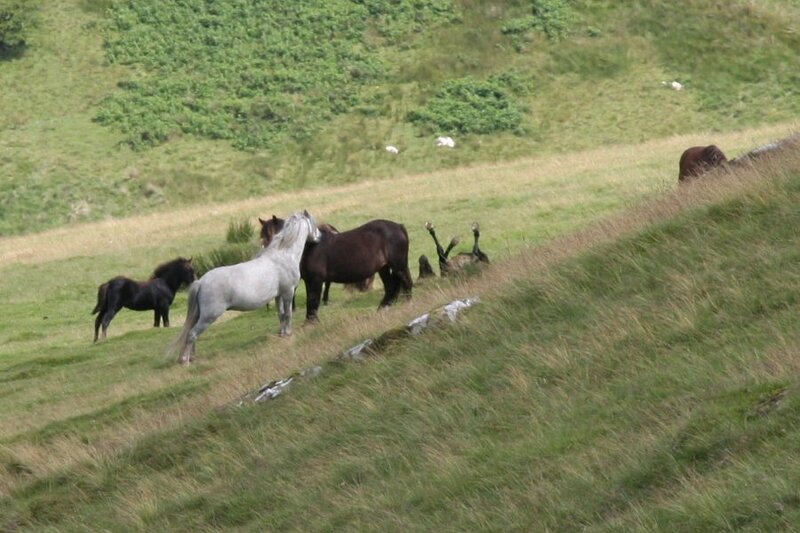 Welsh mountain ponies enjoying life on the hillsides. Looking down the scarp onto the rippled moraine. It is a really long way down from here. Showing the angle of the scarp. Not as vertical as the ones in Snowdonia, but impressive for the Brecon Beacons. 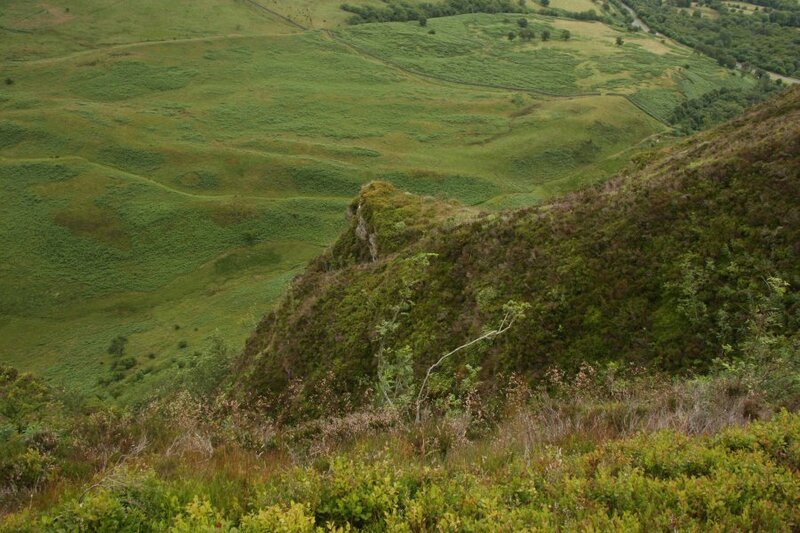 Looking along the western slopes of the immense scarp towards Fan Frynych, with trees for scale. A large part of the distant scarp has visibly collapsed and slumped down the slope. 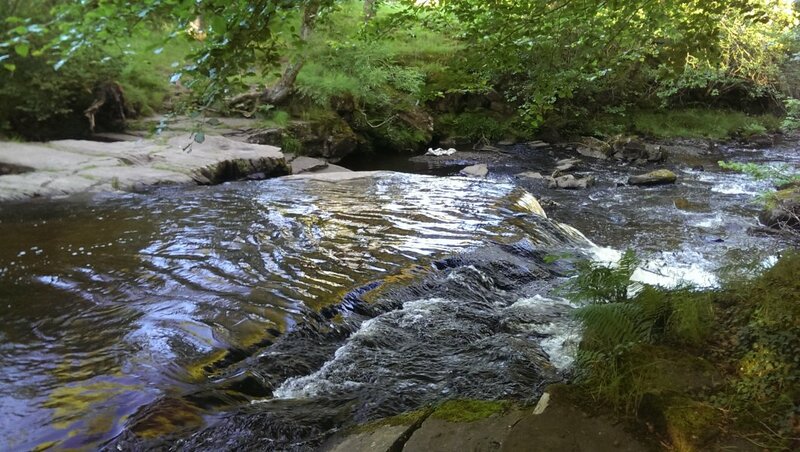 The name means "crag of the salmon rocks", referring to the salmon-coloured streaks of the Old Red Sandstone rock which can be seen on many of the Brecon Beacons scarps. The similarity between the words "glacial" and "gleisiad" is coincidental, but quite appropriate here. View from the Craig Cerrig-gleisiad summit, showing all other mountains in the Fforest Fawr range; Fan Fawr (734 metres), Fan Llia (632 metres) and its Fan Dringarth bump, Fan Nedd (663 metres), Fan Fraith (668 metres). To the right of Fan Fawr is Craig y Llyn (600 metres). In the distance beyond Fan Gyhirch are Fan Hir (761 metres) and Fan Brycheiniog (802 metres), the tallest mountains in the Black Mountain range. The corrie and cliff showing the extensive moraine. Fracture in the ground near the cliff edge, close to the collapsed part of the scarp. I located this fracture by falling in it. Fortunately, it was only a small hole, but how long before this part of the cliff gets repositioned further down it? Pond near the cliff - not all of the ground is fractured, and this part gives rise to the Nant Cwm-du stream, flowing away from the cliff. The top of the ancient landslide, and the view where I prepared my lunch. It's been a long time since I last cooked some savory rice on a camping gas stove in the mountains. On the left are the Black Mountains, with Lord Hereford's Knob/Twmpa (690 metres), Rhos Dirion (713 metres), Waun Fach (811 metres) and Pen y Gadair Fawr (800 metres) being distinguishable. Mynydd Llysiau (663 metres) sits in front of Waun Fach. Mynydd Troed (609 metres) and Mynydd Llangorse (515 metres) sit in front of Rhos Dirion, appearing only as fields. 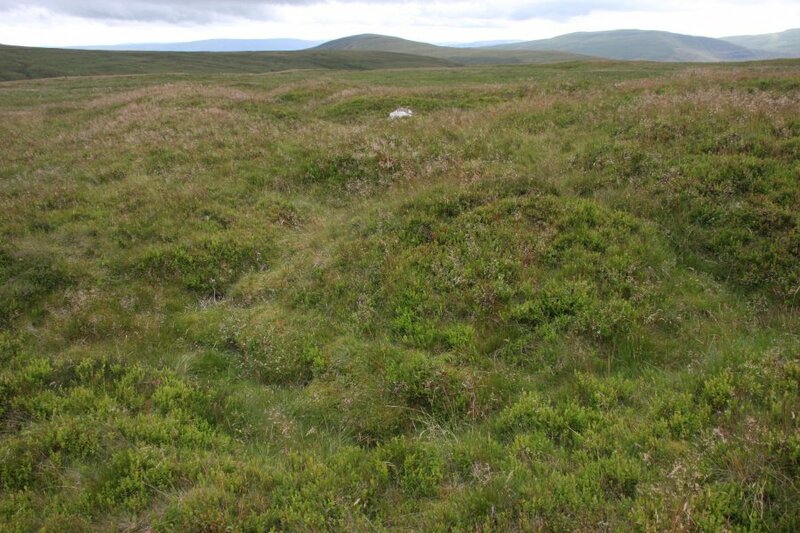 Slumped land on the way to Fan Frynych. Another fracture or water worn? View from the summit of Fan Frynych, again showing all other mountains in the range, as well as the other three main ranges of the Brecon Beacons. 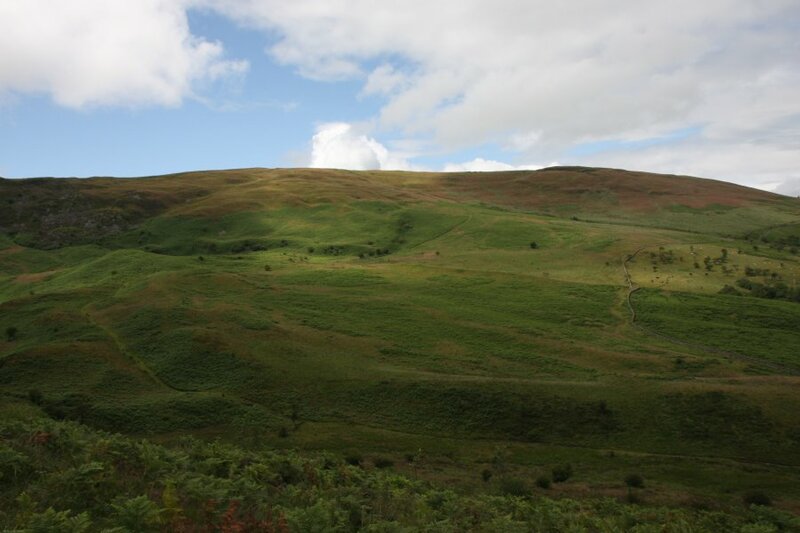 Black Mountains: Lord Hereford's Knob/Twmpa, Rhos Dirion, Waun Fach, Pen y Gadair Fawr, Pen Twyn Mawr (658 metres), Pen Twyn Glas (646 metres), Mynydd Troed, Mynydd Llangorse and Mynydd Llysiau. Central Beacons: Pen y Fan, Corn Du, and Y Gyrn. 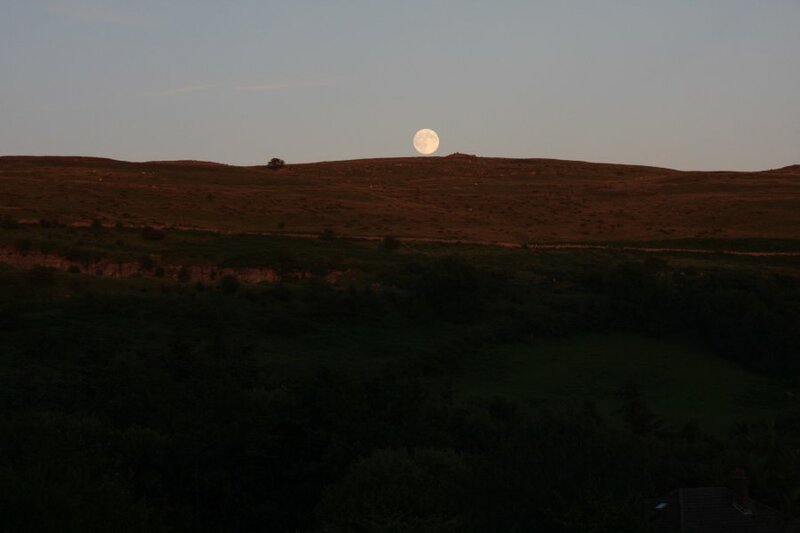 Fforest Fawr: Fan Frynych, Craig Cerrig-gleisiad, Fan Llia, Fan Nedd, Fan Fraith and Fan Gyhirych. 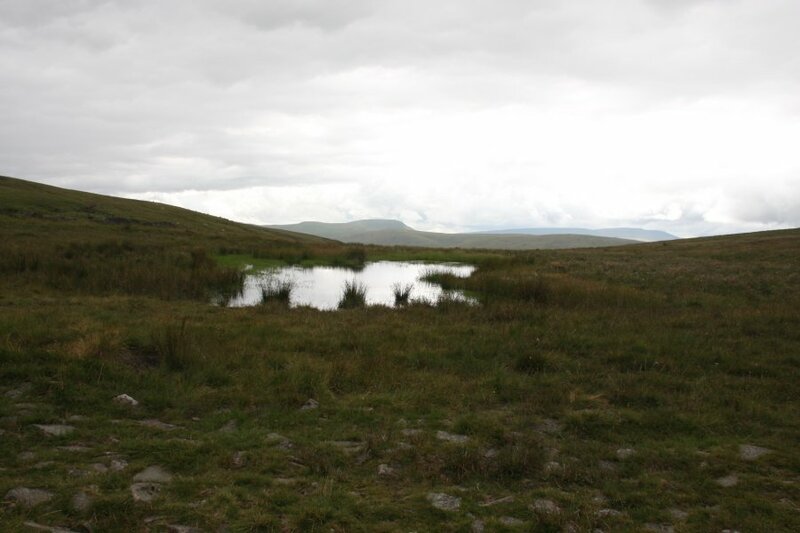 Black Mountain: Fan Hir and Fan Brycheiniog. And Craig y Llyn. Back at the landslide. 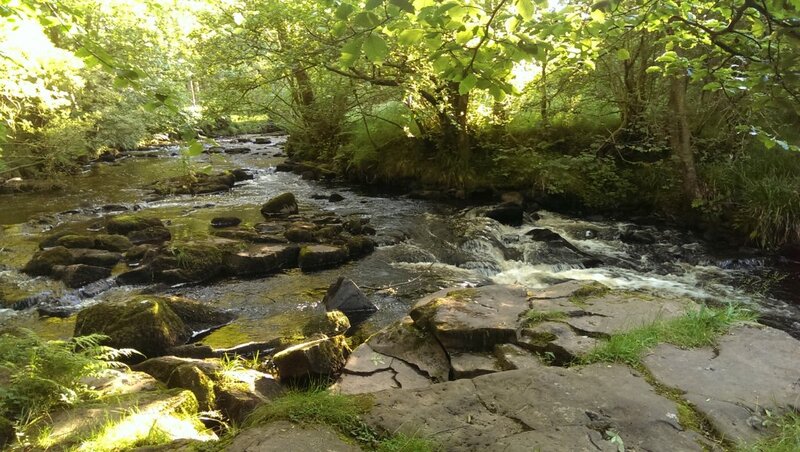 This apparently is quite old, dating from some time after the ice age which created the corrie. Moraine ridge, running down the valley like a medial moraine instead of across it like a terminal moraine. This has apparently been modified by subsequent minor glaciation, and is not all in its original position. 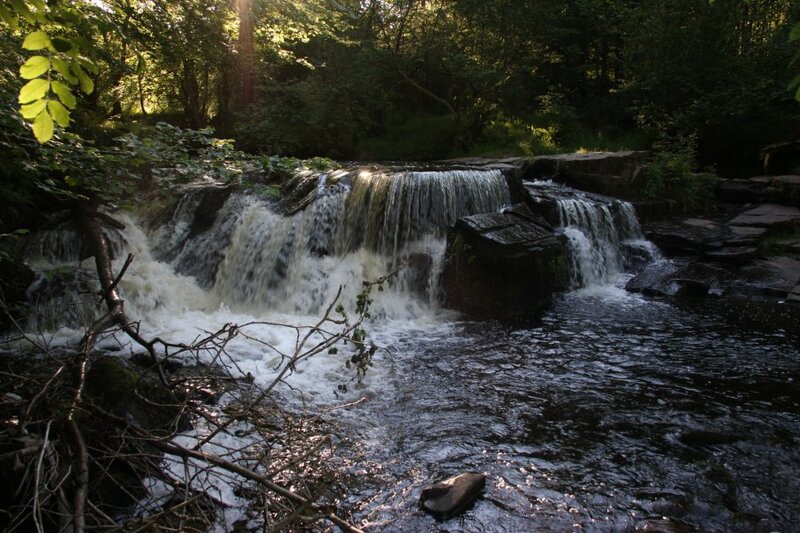 Small waterfall on the Taf Fechan, upstream of the Pentwyn reservoir. 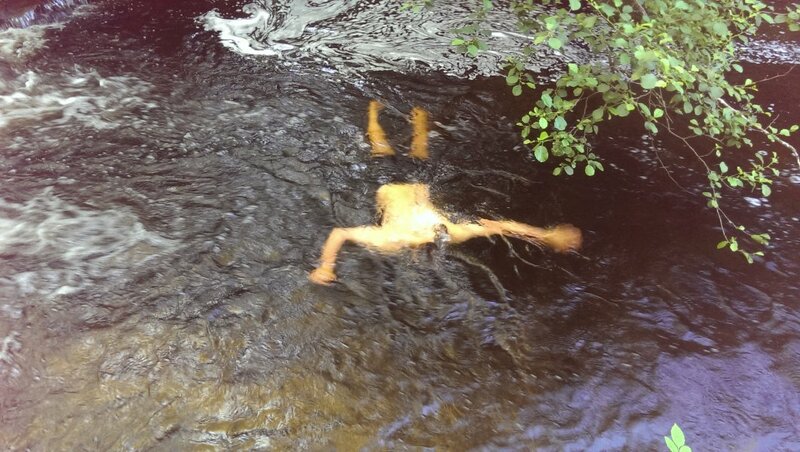 Swimming in the Taf Fechan. The water is extremely cold, by the way. 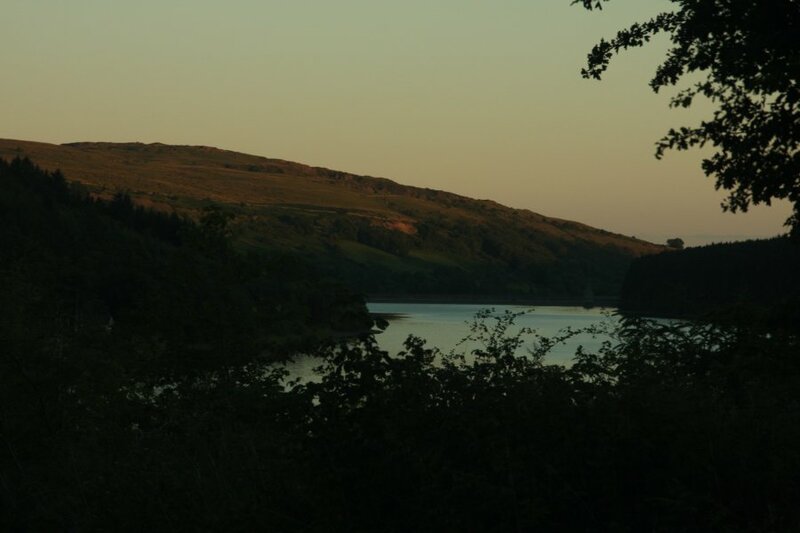 Dying light over Pontsticill Reservoir.